The Digital Photogate Free Fall Apparatus retains the precision of older models while eliminating the hassle of setting up heavy steel columns and adjusting spark recorders. 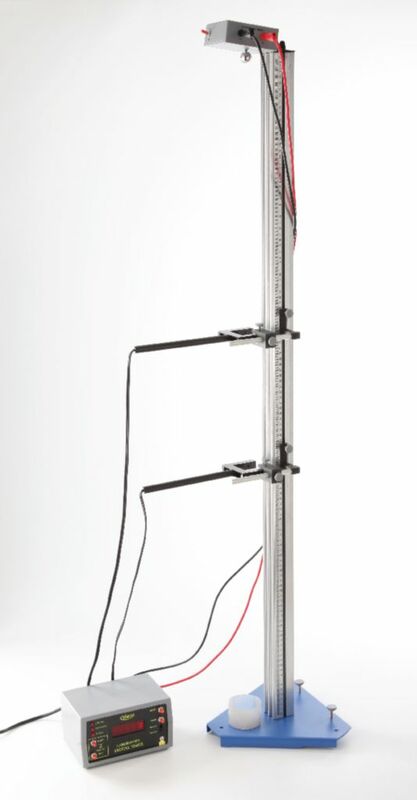 The apparatus consists of a lightweight, extruded vertical column that carries a release electromagnet, two adjustable photogates, and a catching bag. The falling body is a 1.8 cm dia. steel ball. The required Digital Timing System, sold separately, has several operating modes that allow different series of up to ten measurements to be made. These include the times of fall from rest to the first photogate, the times to fall between the two photogates, and the times to pass through each photogate. After the conclusion of a series, the apparatus displays the measured times. This comprehensive set of data not only allows a precise determination of the gravitational acceleration, but also permits verification of the equations of accelerated motion. Delivery information: This item is not available for sale in Canada.